Sporozoite Normal numbers of oocysts and salivary gland sporozoites are formed. Sporozoites are defective in gliding motility and hepatocyte cell traversal in vitro (see also 'Additional remarks phenotype' for further description of the sporozoites). Sporozoites are less infective to hepatocytes in vitro and to mice after intravenous inoculation of sporozoites. Sporozoites could not be transmitted to naive mice by mosquito bite. Liver stage Normal numbers of oocysts and salivary gland sporozoites are formed. Sporozoites are defective in gliding motility and hepatocyte cell traversal in vitro. Sporozoites are less infective to hepatocytes in vitro and to mice after intravenous inoculation of sporozoites. Sporozoites could not be transmitted to naive mice by mosquito bite. 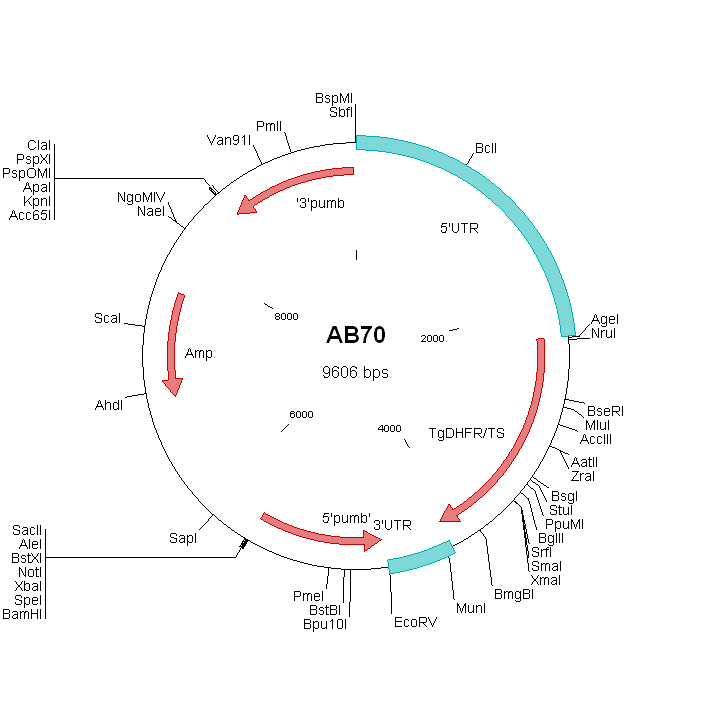 The mutant lacks expression of the RNA binding protein Puf2. The roles of Puf (Pumilio and fem-3 mRNA binding factor) proteins are diverse yet intimately involved in the translational regulation of developmental and differentiation factors in organisms as diverse as yeast, C. elegans, Drosophila and humans. Two such proteins, Puf1 (PFE0935c) and Puf2 (PFD0825c), are known in the human malaria parasite, P. falciparum, with orthologs in all Plasmodium spp. characterized. The Plasmodium Puf proteins have the typical highly conserved organization that includes the eight tandem copies of the PUM RNA binding domain (or Pumilio Homology Domain, PHD) at the carboxyterminus of the protein and expectedly PfPuf2 was shown to bind RNA in vitro. In P. falciparum evidence has been reported for a role for Puf2 in gametocyte development although Pfpuf2 is most highly transcribed in sporozoites (see also 'Additional Information'). The phenotype analyses indicate that Puf2 is not essential for blood stage development, production of gametocytes, ookinetes, oocysts and sporozoites. However, sporozoite gliding motility, cell traversal capacity and infectivity is affected. Evidence is presented that sporozoites in the absence of Puf2 'prematurely' initiate development into the early livers stage (EEF's) inside salivary glands (see below). The phenotype analyses indicate that the RNA binding protein Puf2 regulates the transition of sporozoites into liver stage forms. Evidence is presented that sporozoites in the absence of Puf2 'prematurely' initiate development into the early livers stage (EEF's) inside salivary glands. This is based on morphological changes of sporozoites in salivary glands, at day 18-27after mosquito infection, resembling transformation of sporozoites into the early liver stage after hepatocyte invasion and on genome-wide transcriptional changes in sporozoites that accompany the morphological changes. In P. falciparum Puf2 expression has been demonstrated in gametocytes and disruption of Pfpuf2 (PFD0825c) resulted in increased gametocyte production and increased differentiation of male gametocytes (Miao J. et al., 2010, 123-1039-1049). The phenotype of the P. falciparum mutants lacking expression of Puf2 has not been analysed during mosquito development. See mutants RMgm-513 and RMgm-514 lacking expression of Puf1 ((PBANKA_123350) . Phenotype analyses of these mutants indicate that Puf1 is not essential for blood stage development, production of gametocytes, ookinetes, oocysts and infective sporozoites and for mosquito transmission and liver stage development . Mutant RMgm-591 that lacks expression of both Puf1 and Puf2 shows the same phenotype as mutants lacking only expression of Puf2.